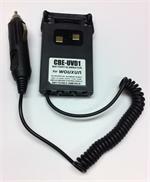 CBE-UVD1 : Battery Eliminator for Wouxun radios. CBE-UVD1 : Battery Eliminator for Wouxun radios. Fits KG-UV3D, KG-UV6X, KG-UV3X Pro, KG-UV5D, DB-16X, GU-16, KG-689, KG-669, KG-679, KG-659, KG-699E, KG-UVD1P, etc.